Children ages 2-7 are invited to explore the Milwaukee County Zoo’s new ropes course designed specifically for little tykes! 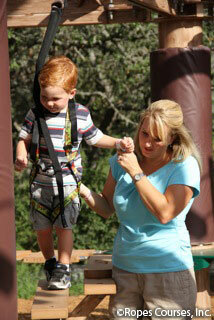 What makes the SkyTrail® Ropes Course, Zip Line and SkyTykes Ropes Course uniquely suited for children? It’s that our SkyTykes Ropes Course area has a built-in walk-through feature allowing a helper, usually a parent, to accompany their child by walking alongside the child as they navigate the course. All children, ages 2-7, height 4’0” and under, are welcome to enjoy the SkyTykes Ropes Course, but a chaperone is required. While you’re at this attraction why not try out the zip line or the three-level SkyTrail® Ropes Course? The zip line launches guests along a 250-foot round trip adventure (500 feet total). The SkyTrail® Ropes Course allows guests to climb three levels in the air, making their own paths through the course without having to unlock their harnesses that are attached to the course by a sling line. Each level has a series of obstacles so participants can test their skill and create their own unique adventure. See you at the SkyTrail® Ropes Course, Zip Line & SkyTykes Ropes Course, sponsored by Tri City National Bank, open daily through Labor Day. After Labor Day, the attraction is open weekends only through October.